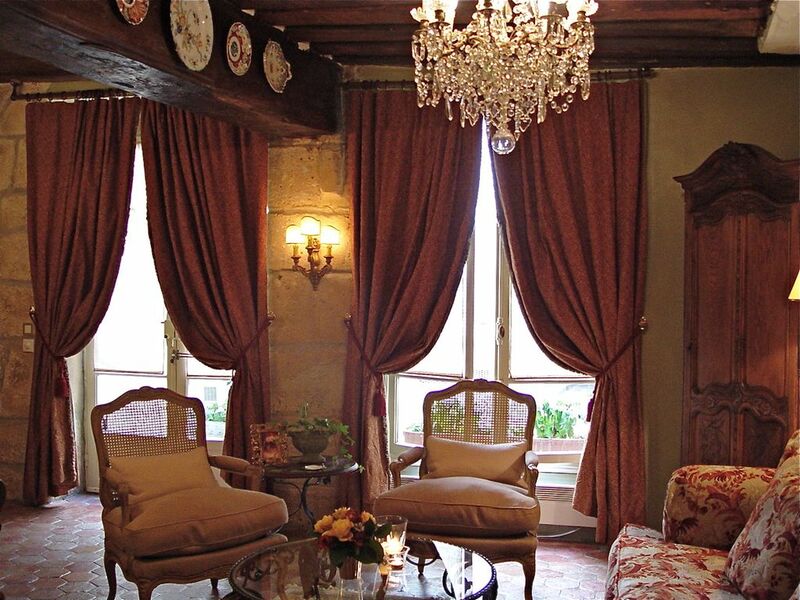 ILE SAINT-LOUIS 3-Room Luxury Apartment - Dreamy & Romantic Old World Charm! Visiting Paris is like entering a dream world. Vacationing in our charming 1635 pied-a-terre on Ile St-Louis is truly living the dream in style. The Old World elegance, the beautiful period antiques and the mere history of this hotel particulier transports you to another time while you continue to enjoy all of the modern amenities that will ensure a comfortable stay. Our apartment is located on a lovely and privileged residential street along the river Seine. Each time you walk out into the courtyard and open the main carriage door to explore the best parts of Paris, you are suddenly overwhelmed by the beauty of the Seine, the ancient trees lining the quai and the magnificent architecture that graces the Right Bank. The two stone bridges that frame this picturesque view are pure romance. You will see boats glide across the river and hear the guides telling dreamy-eyed passengers to make a wish as they pass under the 17th Century Pont Marie. Yes, wishes and dreams do come true here on Ile moment. The island itself is a magical oasis, a very special little village boasting authentic Parisian cafes, art galleries, boutiques, antique shops and book sellers. You shall never hunger nor thirst as the island offers some of the best in epicurean provisions: patisseries and boulangeries (pastry and bake shops), an award-winning boucherie (butcher shop), a delightful fromagerie (cheese shop), wine purveyors, primeurs (fresh fruit and vegetable markets), epiceries (grocery stores), chocolate shops, a fleuriste (flower shop) and, of course, the famous Berthillon ice cream. The many restaurants located on the Ile offer visitors a wide range of menu choices, including the 3-starred chef Antoine Westermann's masterful vegetable cookery at his highly acclaimed Mon Viele Ami and the quietly sophisticated l'Orangerie with chef Michel del Burgo, formerly 3-starred at le Bristol, Taillevent and Moscou, directing the kitchen. For the 'freshest sushi in Paris' head to Isami located on the south side of the island. At dusk, stroll across the pedestrian bridge connecting Ile St-Louis to the neighboring Ile de la Cite, capturing a wonderful view of Notre Dame's dramatic flying buttresses and the lovely gardens below. You will usually find live entertainment on this pedestrian a lively string quartet, a creole jazz band or traditional French accordion melodies as you take in the glorious panoramic river views to the east and west. As the surrounding bridges, the towers and the grand palace of Hotel de Ville are gradually illuminated you find yourself standing in a live picture postcard. There is simply not a more romantic place on this you must see for yourself. The apartment at quai de Bourbon is a deliberate extension of the island's atmospheric magic. Located on the ground floor just off the main courtyard, this 'petite maison' of 44 square meters (roughly 500 square feet) embraces the true spirit of Ile St-Louis. Ancient tomettes - terracotta tiles reclaimed from 17th and 18th Century chateaux - set the tone for a warm and inviting palette of burnt red, golden ochre and celery green. The fabrics are luscious, the antiques tasteful and the decorative accessories absolutely charming. The shimmering crystal chandeliers and antique wall sconces may be dimmed to create the perfect romantic setting. This is your cue to chill the champagne! The luxurious bedroom enrobed in silk and velvet is awash with the softest grays and baby blues to lull you to sleep. There is a spacious armoire to house your personal belongings and adequate bedside lamps for reading. Luxury bed linens, pretty antique prints and scented sachets create a relaxing respite after a full day of sightseeing and shopping. You will discover a little taste of the Orient in the compact but efficient bathroom. The Chinese red of the cabinets accents the exposed beams and stone while 18th Century Japanese wood block prints decorate the lacquered walls along with antique Asian porcelain. The tower cabinet provides ample room for your personal items and also houses the collection of plush bath towels. The cheerful kitchen with its blue and white toile de Jouy fabric and decorative tiles, painted red ceiling beams and ochre walls is fully equipped with everything you need to create a fabulous meal. If cooking isn't on your agenda, the fridge is always ready to chill your favorite bottle of champagne and the freezer available to hold several litres of Berthillon ice cream! Sample delicious espresso with the easy-to-use Nespresso machine. A full range of kitchen appliances, as well as a conventional washer and dryer are all provided with simple instructions for use. Cable television, CD player/stereo, WiFi high-speed fibre internet service and a well-stocked Paris travel library help keep you entertained, informed and in touch. We welcome you to a world of comfort, luxury, history and romance. Come be our guests for 'A Fine Taste of Paris'. Passionate Francophiles invite you to enjoy their charming 17th Century apartment decorated in the spirit and style of Ile St-Louis. Discerning travelers, as well as lovers of antiques, art and history will truly appreciate the stylish decor and luxurious amenities of this romantic pied-a-terre. The moment we discovered the magical Ile St-Louis we knew it would be our home someday! The romantic village atmosphere of this jewel in the Seine is what sets it apart from the rest of Paris. It was a splendid destiny that led us to become the happy owners of this special apartment. We are delighted to be able to share the charms of this wonderful pied-a-terre with our visitors! 1 Shower with Regular shower head and hand-held shower spray. Storage tower and lighted vanity sink. Underground City Parking is Available at Several Nearby Locations. Please ask for more details. The Batobus Water Taxi is located just across the bridge, Pont Louis-Philippe. This hop-on hop-off all day boat stops at 7 points along the River Seine to visit all the main tourist attractions. Bathroom is not accessible by wheelchair due to the width of the door frame. We enjoyed our stay at this property. Especially having a washer and dryer. I would recommend this property. Best location in Paris. Close to everything. Apartment was spacious and comfortable. Off street location via courtyard was quiet and cool during busy warm day. Last night walked out door and had wine and dinner on banks of Seine. Gail was stand in greeter and wonderful host. Perfect start to our European adventure. We loved our time in Paris and our charming apartment. It was a great location with a short walk to the local markets for bread, cheese, fruits and the train stop nearer Notre Dame. It is well appointed with everything one needs for their stay. We will be back! Centrally located, ease of entry & good communication-loved Ile Saint Louis & getting to know locals. It was nice having our own place to come back to every day.! 100% refund if cancellation is requested 90 days before arrival/reservation date. It is highly recommended that you purchase travel insurance that covers pre-paid expenses in the event of a cancellation.